AOA Decals has provided this rather neat sheet for nautical aircraft modelers. Specially those who do USN and USMC aircraft. 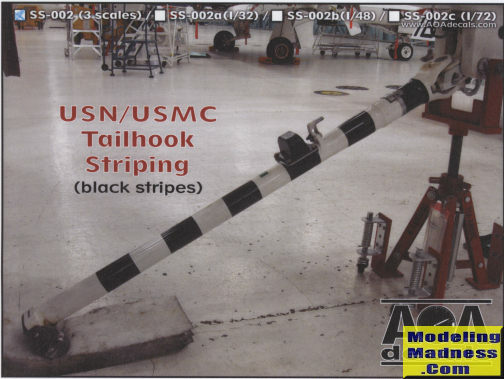 In this case, it is a set of tailhook stripes. This particular sheet covers all three major scales. For those of you who do not build in all three scales, that is not an issue, as you can get a specific scale separately for $3.50 a sheet. These are really easy to do. The stripes are already properly separated from each other so you simply need to figure how many stripes your tailhook has, then cut the sheet across the rows to encompass the number required. 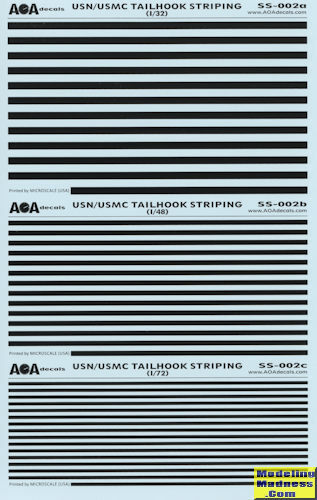 There are twelve rows of stripes in each scale, so if you need nine stripes, simply count out nine and cut them as wide as you think you'll need to cover the tailhook. This is a real help, especially for those kits that either don't provide a tailhook decal or that have them provided in the incorrect number. The sheet comes with full instructions on just how to do this. I think this is a great idea as my tailhook stripes often look terrible so this will be a real boon.